The EUR/USD is moderating around our 1st tier uptrend line after taking another step down on Friday. Investors responded to encouraging U.S. consumer-related data buy buying up the Dollar across the board. This was the second Friday in a row that we witnessed a preference for the Dollar in reaction to positive U.S. econ data. Investors should take note of the development for the relationship could persist if U.S. data continues to improve. Although the data wire is relatively quiet today, the EU did release an Industrial Production figure meeting analyst expectations. Even though the FX markets are rather quiet right now, activity could pick up during tomorrow’s session with the release of key econ data from around the globe. From the EU investors will receive ZEW Economic Sentiment data. Analysts are expecting a slight decline in the ZEW numbers while remaining above the expansion threshold (50+). If tomorrow’s ZEW data should disappoint, we could witness further weakness in the EUR/USD as investors find another reason to snap up the Dollar. In addition to tomorrow’s EU data, investors will also receive pricing data from Britain and the U.S. along with TIC Long-Term Purchases, the Empire State Manufacturing Index, Capacity Utilization Rate and U.S. Industrial Production. Hence, another wave of key U.S. data could yield further Dollar volatility. Technically speaking, the EUR/USD is fighting to stay above our 1st and 2nd tier uptrend lines. These uptrend lines may carry some weight since they run through September and August lows, respectfully. If our 1st tier doesn’t hold, then the EUR/USD has additional technical supports in the form of 11/3 lows and the psychological 1.45 area. However, it seems the EUR/USD is testing the patience of its uptrend since our new 1st tier runs through 8/17 lows, meaning if it doesn’t hold we could eventually witness a more protracted decline towards 1.40. However, before we get ahead of ourselves, we’ll have to wait and see how the EUR/USD interacts with present technical cushions. As for the topside, the EUR/USD still faces multiple downtrend lines along with 12/9 and 12/8 highs. The Cable is consolidating along our 2nd tier uptrend line as we notice similar intraday patters in the EUR/USD and gold. Due to the relative lack of economic data, it seems investors are waiting for tomorrow’s slew of data from across the globe. Britain will release more pricing data on Tuesday, including CPI and RPI data points. Tomorrow’s data will go along with Friday’s disappointing PPI figure. Hence, it will be interesting to see if we witness a broad decline in UK prices. Should all pricing data print below analyst expectations it may be difficult for the BoE to maintain its new neutral/hawkish monetary stance. Furthermore, if tomorrow’s UK pricing data prints negatively and U.S. data outperforms once again, we could witness another wave of Dollar buying similar to what occurred on Friday. Meanwhile, FX investors are presently showing little reaction to Abu Dhabi’s announcement that it will provide $10 billion to help Dubai settle some of its expiring debt. However, we will have to see how U.S. equities open and whether activity picks up as the session progresses. Technically speaking, the Cable appears to be flirting with dangerous territory since our 2nd tier uptrend line runs through October lows. Hence, should our 2nd tier uptrend line give way we could witness another sizable leg down towards the 1.58-1.60 area. Below our 2nd tier uptrend line the Cable does have our 1st tier uptrend line (off chart) serving as a technical cushion along with the psychological 1.60 level, September lows and October lows. As for the topside, the Cable still faces multiple downtrend lines along with 12/9 and 12/7 highs. Furthermore, the psychological 1.65 level could serve as a technical barrier should it be tested. Friday’s rally lost steam as the USD/JPY was deflected from our 2nd tier uptrend line. The USD/JPY neglected to retest the highly psychological 90 level again despite another broad-based wave of Dollar strength in reaction to positive U.S. consumption data. However, the USD/JPY is still trading well above 12/9 lows, indicating the currency pair may be awaiting a signal from other major Dollar pairs. That being said, both the EUR/USD and GBP/USD are currently testing the patience of some key uptrend lines, meaning another leg down in these currency pairs could be in the making. However, it remains to be seen how the USD/JPY would react to such a movement since the USD/JPY’s behavior depends on whether a pullback stems from risk-aversion or broad Dollar strength. Hence, investors may want to keep an eye on tomorrow’s key econ data releases, highlighted by U.S. PPI, Industrial Production, and TIC Long-Term Purchases. Should tomorrow’s set of U.S. data outperform again, we could experience another leg up in the Dollar, a positive development for the USD/JPY. Meanwhile, Japan released economic data of its own. Japan’s Tankan Manufacturing Index printed stronger than analyst expectations, resulting in a slight Yen bounce during the Asia trading session. Technically speaking, the USD/JPY is presently locked between our 2nd tier downtrend and 3rd tier uptrend lines, a supportive environment for further intraday consolidation. As for the topside, the currency pair faces multiple downtrend lines along with the highly psychological 90 area 12/11 highs and 12/7 highs. As for the downside, the USD/JPY has built a comfort zone between present price and our uptrend lines. Additionally, the USD/JPY has 11/23, 12/8, and 12/9 lows serving as technical cushions. Gold has managed to avoid a retest of the psychological $1100/oz level thus far. The precious metal is about where we left it on Friday as we witness consolidative patterns in the FX markets. Gold has been under quite a bit of selling pressure since the beginning of the month, so consolidation is a healthy technical development for the time being. That being said, the EUR/USD and GBP/USD are testing the patience of their uptrend by consolidating just above their respective key uptrend lines. Hence, another wave of Dollar strength could result in a sizable leg down in both currency pairs, meaning gold could follow suit considering its negative correlation to the Greenback. As a result, investors should keep an eye on the major Dollar crosses as we receive another set of key economic data from the U.S., EU, and Britain. The EU will release ZEW Economic Sentiment data followed by CPI and RPI figures from the UK. However, the spotlight could be on the U.S. since it will release its PPI, Empire Index, Industrial Production, TIC Long-Term Purchases, Capacity Utilization Rate, and Industrial Production. Should America’s econ data outperform once again it will be interesting to see whether the FX markets experience another wave of broad-based Dollar strength. Technically speaking, gold has multiple uptrend lines serving as technical cushions along with 12/9, 11/13, and 11/10 lows. Furthermore, the psychological $1100/oz level could serve as a reliable technical support should it be tested. As for the topside, we’ve placed a downtrend line on our chart, albeit a steep one. Additionally, gold faces topside technical barriers in the form of 12/9 and 12/7 highs along with the psychological $1150/oz and $1175/oz levels. Crude futures have dipped below the psychological $70/bbl despite consolidation in the Dollar and U.S. equities. Hence, today’s decline in crude may be a result of the deteriorating technical conditions we’ve witnessed so far this month. That being said, crude futures are trading well off intraday lows after bottoming out comfortably above September lows. It seems investors may hold crude together due to today’s slight weakness in the Dollar coupled with the S&P futures posting moderate gains. Meanwhile, investors are awaiting tomorrow’s key econ data releases followed by Wednesday’s Fed monetary policy decision. Tomorrow crude investors may pay closer attention to U.S. Industrial Production and the Empire Manufacturing Index. An uptick in production and manufacturing could imply a greater demand for and consumption of crude. However, should U.S. data print positively and the Dollar strengthen in reaction then the crude could be under further selling pressure since the futures have been more tightly correlated with movements in the Dollar. Therefore, investors should keep an eye on the Dollar’s reaction to tomorrow’s wave of economic data. Technically speaking, crude futures still do have some noteworthy technical cushions in play, including the psychological $70/bbl area along with October and September lows. 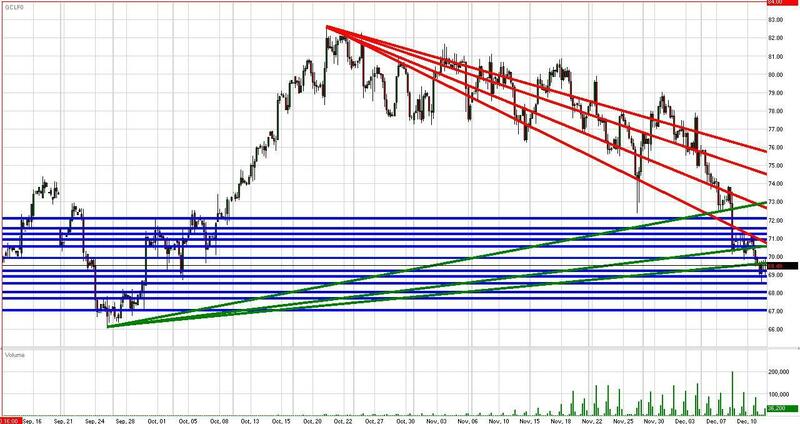 As for the topside, crude futures still face multiple downtrend lines along with 12/10, 9/22, and 12/8 highs. Meanwhile, the psychological $70/bbl level could begin to work against crude futures should today’s sell-side activity persist. The S&P futures failed to register the positive performance investors would have anticipated following Friday’s impressive Retail Sales and UoM Consumer Sentiment data. The futures carved out only slight gains as we witnessed another leg up in the Dollar in reaction to further improvement in key U.S. econ data. The Dollar’s strength managed to hold down equities since the two have been negatively correlated from the onset of the economic crisis. A weakening Dollar has benefitted U.S. exports and created a discount on American assets. Hence, further sizable strength in the Dollar could have a similar negative impact on U.S. equities. Meanwhile, Abu Dhabi announced it will provide Dubai with $10 billion to help settle some of the outstanding debt. Although the markets registered an initial positive response during the Asia session, the positive news seems to be wearing off. That being said, attention will likely turn to tomorrow’s key economic data releases followed by Wednesday’s monetary policy meeting. Tomorrow the U.S. will release PPI, TIC Long-Term Purchases, Industrial Production, Capacity Utilization Rate, and the Empire Manufacturing Index. Should America’s PPI print hotter than expected, we could witness a positive reaction from the Dollar since an increase in prices could contribute to speculation that the Fed may need to tighten liquidity sooner than expected. Prior to the U.S. session, investors will also receive key data points from the EU and Britain, including EU ZEW Economic Sentiment and the UK’s PPI and RPI figures. As a result, volatility could pick up in the FX markets tomorrow. Hence, investors may want to keep an eye on the Dollar’s interaction with technical supports, particularly in the EUR/USD and GBP/USD. Should the EUR/USD and Cable experience another leg down, such a development could weigh down on the S&P futures. Technically speaking, the S&P futures have multiple uptrend lines serving as technical cushions along 12/11, 12/8, and 11/26 lows. Furthermore, the highly psychological 1100 level could continue to play a key role as it has for the past month. As for the topside, the S&P futures face technical barriers in the form of previous 2009 highs.